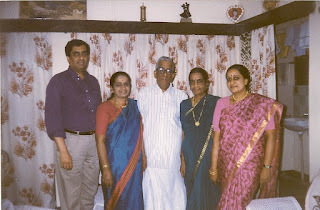 My Amma was an iron lady – a tough taskmaster, intelligent, shrewd, fearless, and honest to the point of being blunt!! Endowed with a typical middle-class mentality, she had great value for every hard-earned penny. All admirable traits, I agree. But her Achilles heel was her poor time-sense. We, the next generation, felt she wasted too much time on trivial matters and were naturally at loggerheads with her. But she had her own unbeatable reasons which were convincing only to her! You see time was not a constraint for her – she had ample time at her disposal but then we belong to the generation which believes it makes judicious use of time. As kids we used to be scared to be caught in the act of mischief by Amma – we dreaded the long-drawn court martial that would follow instantly. There were times when we took cover behind Appa to escape punishment – he wouldn’t use as much as a feather on us! And he didn’t believe in raising his voice or wasting his breath on trivialities. But Amma did – she was prim and proper and expected everything in its proper place. She could riddle us with her glare and stare till we coughed up the truth. If she found something amiss, setting it right would assume top priority, forget cooking or school or office! I still remember about the missing needles. Many a time it would be me who would have used it to mend a loose button and lost it by accident / negligence. Amma would spend hours turning the house upside down, rummaging every cranny, bent on retrieving the lost needle while I would hide away so that her shrewd eyes would not note the guilt pangs writ large on my face! I’d wonder why she made such a hullaballoo about a cheap little needle! After all, it would just cost a couple of paises! I would heave a secret sigh of relief when a disgruntled Amma would reluctantly give up the search for the day. I’d keep my fingers crossed that she’d not restart the hunt all over again the very next day. I’d resolve to buy half a dozen needles which would cost no more than 25 paise and thus end this ‘mountain-of-a-molehill’ matter! It took me years to realize it was not the cost of the item that mattered but the utility value at the required hour! Amma’s penchant for finishing a project - whatever be the time taken and whatever be the chores sacrificed - was definitely irritating to the family. If she was involved in an ‘Operation’, we kids would sometimes have to wait for our lunch even as our stomach made loud rumbling noises. What made us cringe was that most of the time it would be about what we’d consider a trivial issue – like looking for a particular vessel which had gone ‘missing’. “What the …! Couldn’t she use another vessel and look for it later – as if there was a dearth of vessels at home? !” And for all you know, that vessel would make its appearance when she’d be looking for something else! So why waste breath on searches galore – I simply couldn’t understand and still can’t! Once I got delayed for school – Amma had found a lousy little louse while plaiting my hair and she binged on ‘Operation Lice Clearance’ and went on and on combing my hair with the special comb. I was awarded punishment by my teacher for being late to school; I was also rewarded with a sore head after all that vigorous combing operation! The next day I was simply scared to venture near Amma to get my hair done! No doubt her intentions were good but wasn’t that poor time management! All ladies have the notoriety of being the delaying-factor for any outing – they work overtime in getting dressed – this is an open secret. But I think Amma took the cake in our family. If we had planned an outing at 5.30, both of us sisters would be ready five minutes earlier along with our little boys. Amma would send us a SOS to help her with her hair and choice of sari. Giving a sly furtive glance at our watch, we would pick one of the four saris she’d show. She’d spend another precious five minutes picking up the right matching blouse out of the five in similar shades and carefully arrange the rest back neatly. That’s why she overshot the time –she always maintained a neatly-stacked wardrobe – no shuffling or shoving, pulling or dumping the clothes in a hurry like us. As for us, if we didn’t find a matching blouse for the chosen sari, we’d pull out the sari that would match the blouse in hand – as simple as that! By the way you should see our wardrobe – it needs to be spruced up every week – that’s the price we pay for our punctuality. What delights me to this day is the appreciation from my not-easy-to-please Amma for my quick prim-and-proper dressing ability (including well-draped and neatly pinned sari) complete with matching accessories - ear-rings, rings, pendants, hair clips, purse et al – that too in the hubbub of scores of morning chores before taking off for work. Good that she hasn’t taken a peek into my cupboard – else the kudos would have gone for a toss!! Another time-consuming activity of Amma was the long-drawn- bargain sessions – be it the vegetable vendor or the textile merchant or our jewelers. She simply loved to bargain – who doesn’t? I agree but then we know when to call halt – either from the tone or attitude of the other party. But Amma would keep repeating her argument, the dealer his and we’d be progressing nowhere – and we’d be ready to tear our hair in exasperation. But Amma wouldn’t let us intervene to tide over the status quo. Don’t ask how and when the deal would pull through – every time it would end differently. But Amma would have the last laugh at having saved valuable money even as we’d mutter muffled expletives at the waste of precious time! Clash of ideologies, you’d say! Absolutely! Her penchant for talking was such that she never for once realized that she was indulging in monologues with us most of the time! We’d throw in a ‘hm’ or ‘ha’ as we‘d listen to her continuous talk in which the topics would be repeated in a cyclic order – we’d be too polite to interrupt or curtail her – after all, this was the only luxury she craved for! But then after her massive heart attack, whenever she would start chat sessions, we’d try to silence her, “Okay, take rest. We’ll talk later.” She’d bounce back saying, “Let me say whatever I want to. May be there won’t be time later” and we’d have to give in! We found it ironic that even as she realized the importance of time, she continued to use it for her favorite activity – talking. This time we could not raise any objection! It is two years since Amma has become silent forever. Still her words keep ringing in my mind on various occasions – sometimes bringing a smile, sometimes an acknowledgement of her sense of righteousness and honesty.